At the end of twenty seventeen a few friends told me about a website called Cheerfully Given. 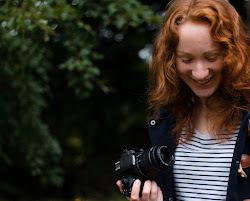 Since I first used it a couple of years ago, I have really enjoyed using the Cheerfully Given site as a way of both finding and supporting Christian creatives. 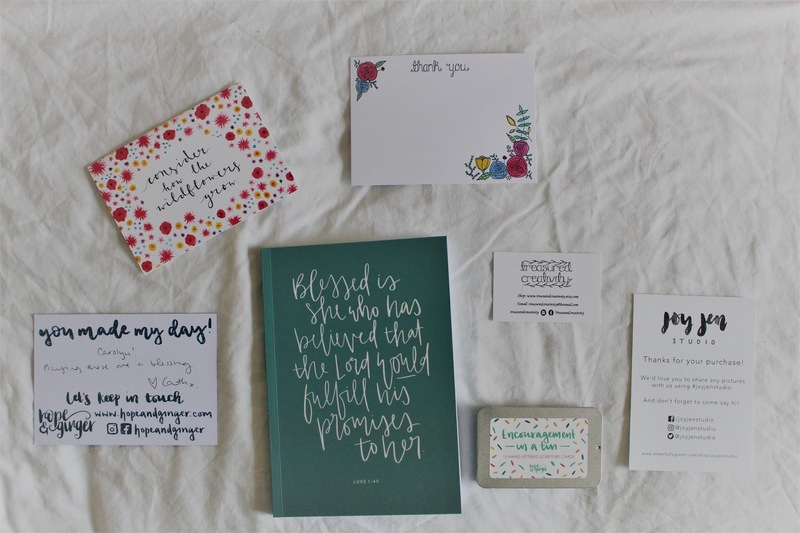 Cheerfully Given is a wonderful site that gathers products from Christian creatives all across the UK and makes it easily accessible to browse from lots of makers and products, and then purchase your items in one payment. It also has a wonderful blog, email newsletter, and sections on the website to find out about the makers behind the beautiful products. I have a fondness for the products from Joy Jen Studio as I find her designs to be so beautiful, and enjoy reading her blog so much. I chose this card with one of my dear friends in mind and I am so thankful that this is the one that I purchased for her. I love the bright colours used on this card and that the floral border really makes the text stand out. The card used also has a lovely texture which gives the product a lovely finish overall. You can view all Joy Jen Studio products on Cheerfully Given by clicking here. I recently had a friend visiting from overseas and had wanted to purchase some items from Cheerfully Given as presents for her when she arrived. I had looked at a few products from Hope & Ginger through her instagram page and chose the Encouragement in a Tin product and the Blessed is She Devotional notebook. These products arrived so beautifully packaged and presented. It meant so much to me receiving these items that have been both created and sent with such love and care. 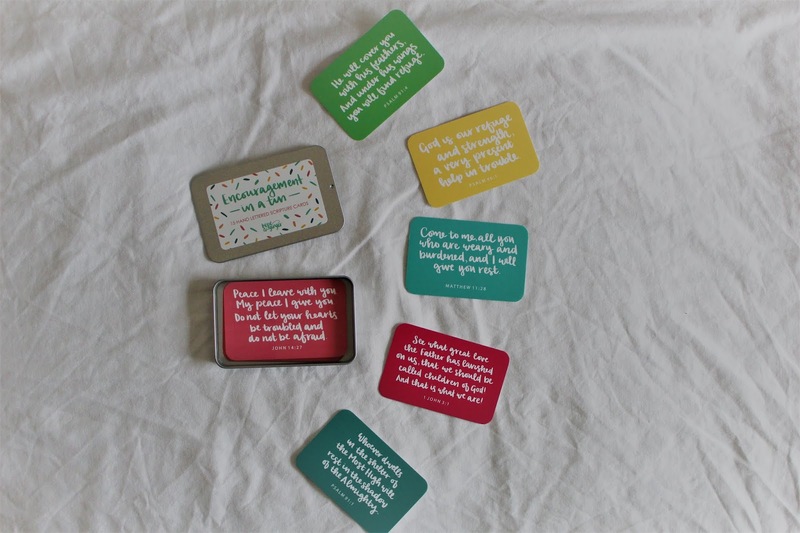 The Encouragement in a Tin set is such a loving and heartwarming concept. The tin itself is a nice, compact size and closes securely so there's no need to worry about losing any of the cards. Each card has a printed verse written in calligraphy, displayed on brightly coloured backgrounds. I was so pleased with this product when it arrived and that I was able to give it as a gift to one of my close friends. Since Cath from Hope & Ginger released her A5 devotional notebooks I have been hoping to get one. 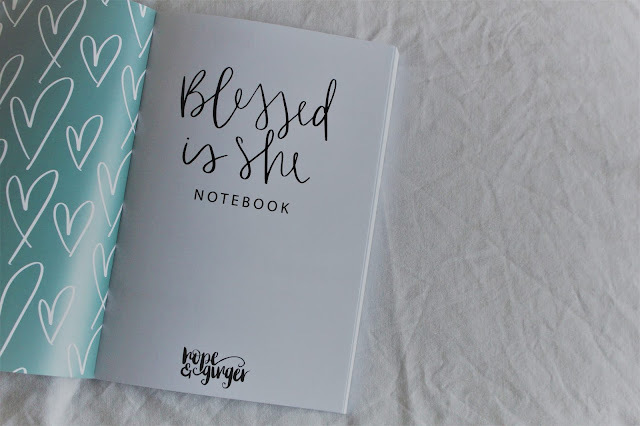 I love the layout of these notebooks; there is a space for prayer points, a thanksgiving list, a verse for each day, as well as a lined section and a blank section to use how you wish. These notebooks are a great way to organise your devotional times, thoughts and prayer, and to look back and see how God has been at work. Again, I was so pleased with this product when it arrived and that I was able to couple it with the Encouragement in a Tin set as gifts for my friend. You can view all Hope & Ginger products on Cheerfully Given by clicking here. I was intentionally waiting to write thank you notes for Christmas presents until I was able to find products I could use from a small business to do this. 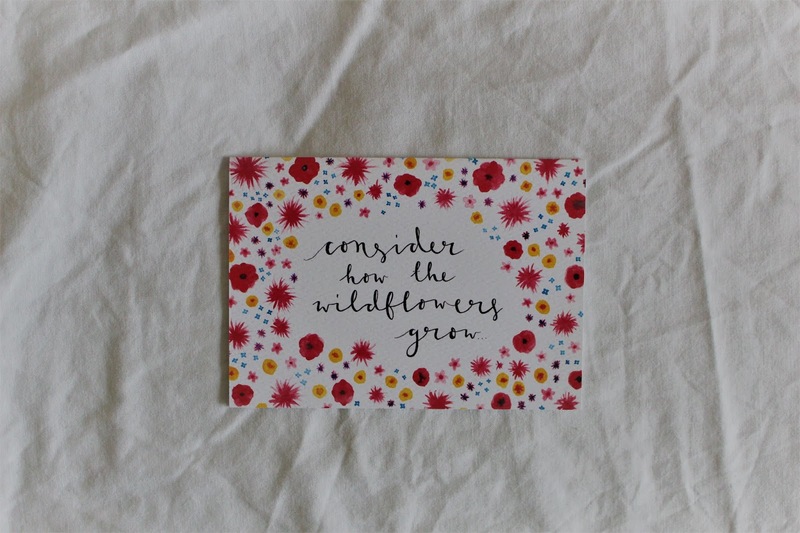 These simple yet elegant note cards from Treasured Creativity were a joy to use. 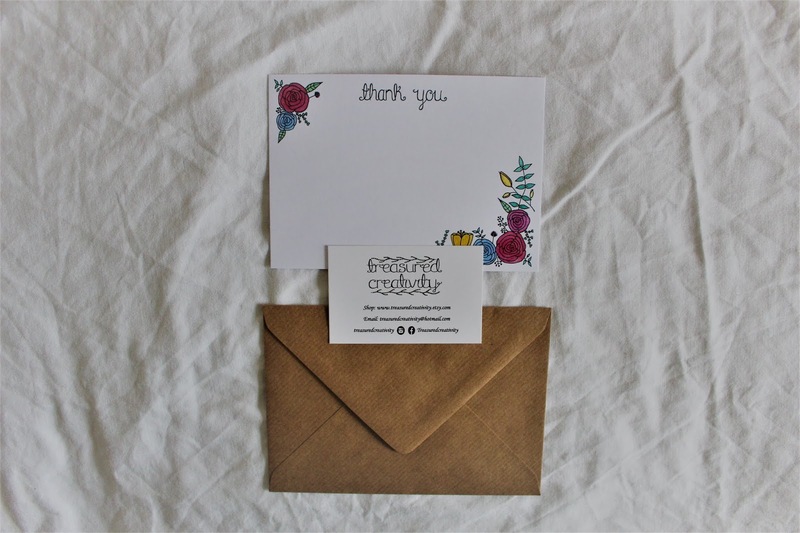 The cards have a smooth finish which makes them easy to write on, the thickness of the card gives them a steady feel, and each card comes with its own little brown envelope ready for posting. 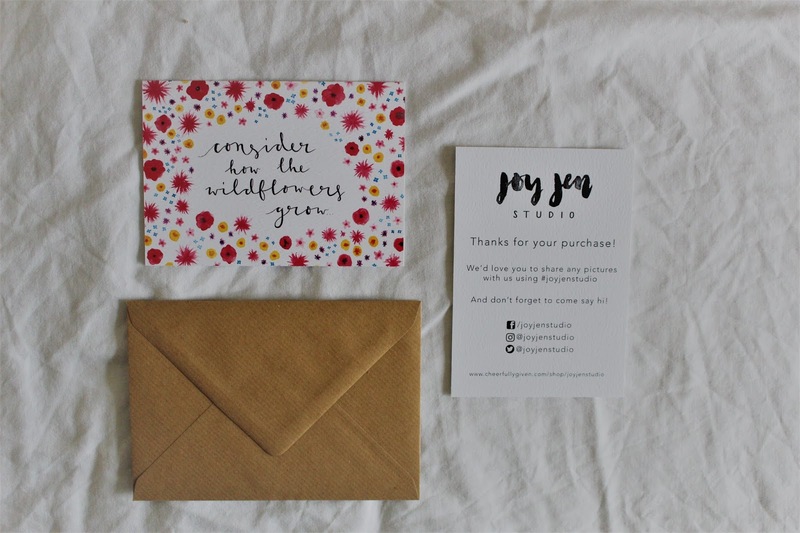 I was so pleased with the quality and design of these note cards that I have now ordered my boyfriends card for valentines day from Treasured Creativity! You can view all Treasured Creativity products on Cheerfully Given by clicking here. Cheerfully Given is such a wonderful website and ministry, and I am so pleased with the products I purchased from the site last month. It is such a wonderful platform were many beautiful products are shared by inspiring creatives. If you would like to take a look at the Cheerfully Given website you can do so by clicking here. The Old Town area of Edinburgh is one of my favourite parts of the city. I love to spend time at the castle, explore the Royal Mile, and wander around the independent shops on Victoria Street. 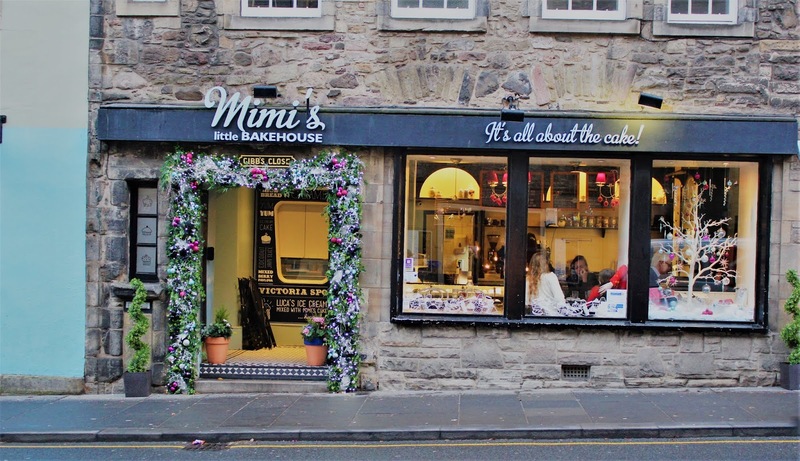 In December I had the delight of visiting Mimi's Little Bakehouse on The Royal Mile in Edinburgh, it is such a beautiful cafe on one of my favourite streets in Edinburgh. 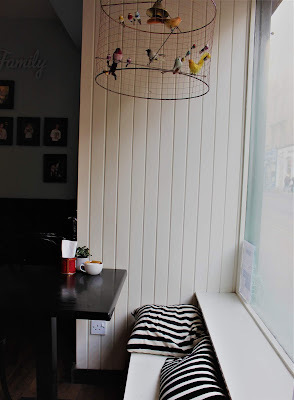 I adore coffee shops, and have a particular fondness for independent stores and smaller businesses. 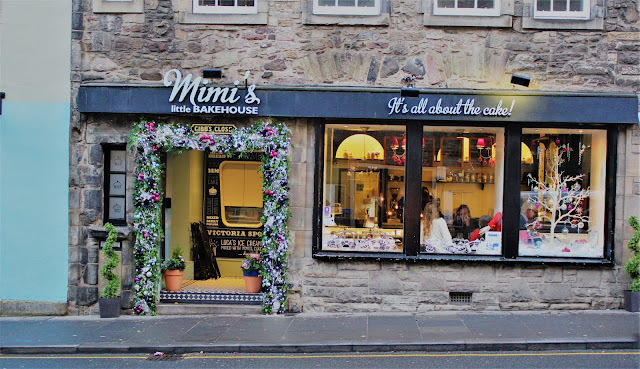 For well over a year now, Mimi's Bakehouse has been on the list of places in Edinburgh that I would like to visit. So, when I was going out for lunch with some friends in the city I knew I wanted to take them to the Bakehouse on the Royal Mile. The store is quite small, however it has a cosy atmosphere and the storefront is so warm and inviting. 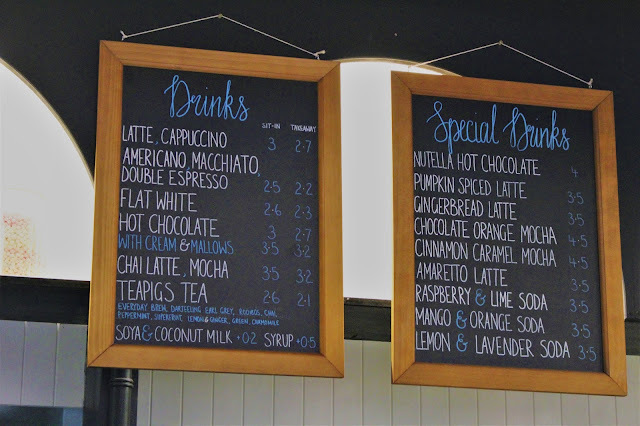 We arrived in time for lunch and were spoiled for choice with the selection of food on the menu, which is displayed by beautiful lettering on chalkboards around the cafe. Two of us had the tomato and roasted red pepper soup, whilst another had a mozzarella and pesto panini with side salad. During winter I enjoy having comfort food, particularly homemade soup with bread. 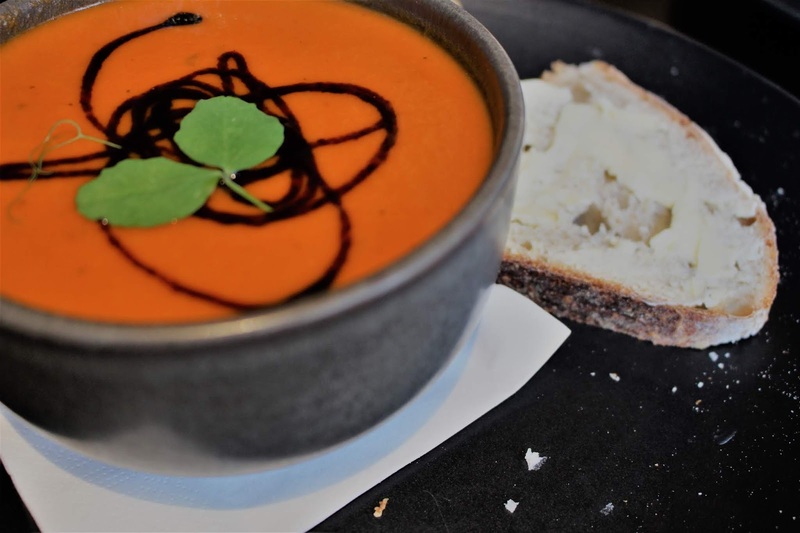 The tomato and roasted red pepper soup did not disappoint, I would have happily ordered a second bowl had I been able to finish another! With Mimi's being a Bakehouse, it is well known for the assortment of cupcakes and traybakes which we were eager to try. 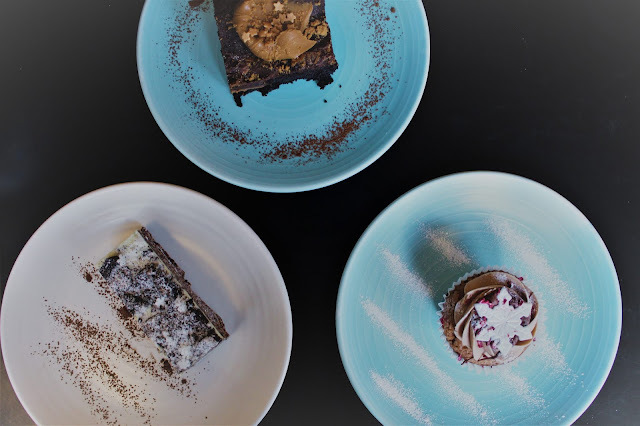 We decided to order a variety of cakes to share between us - although looking back we should have ordered less as we were all quite full already! 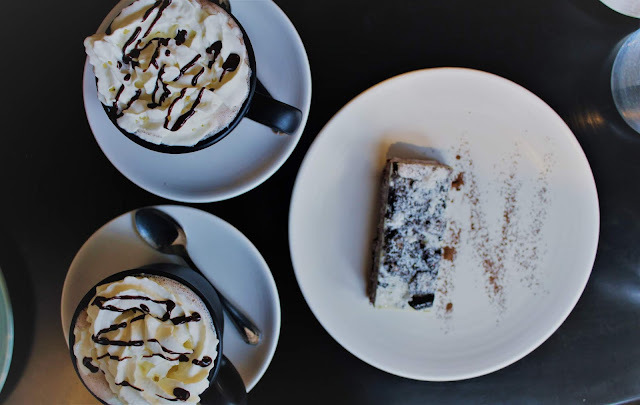 Alongside the sweet treats we also ordered a few mugs of the nutella hot chocolate. 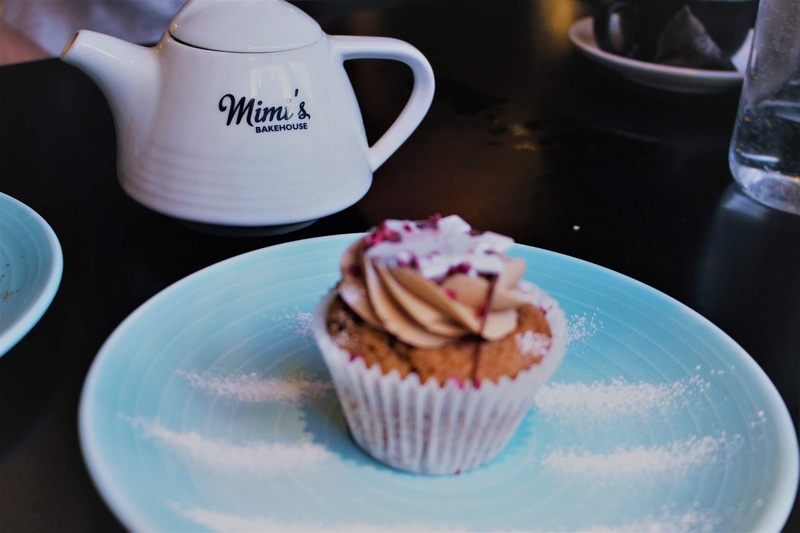 The cupcakes and tray bakes lived up to all the wonderful reviews I had heard about the baking at Mimi's. 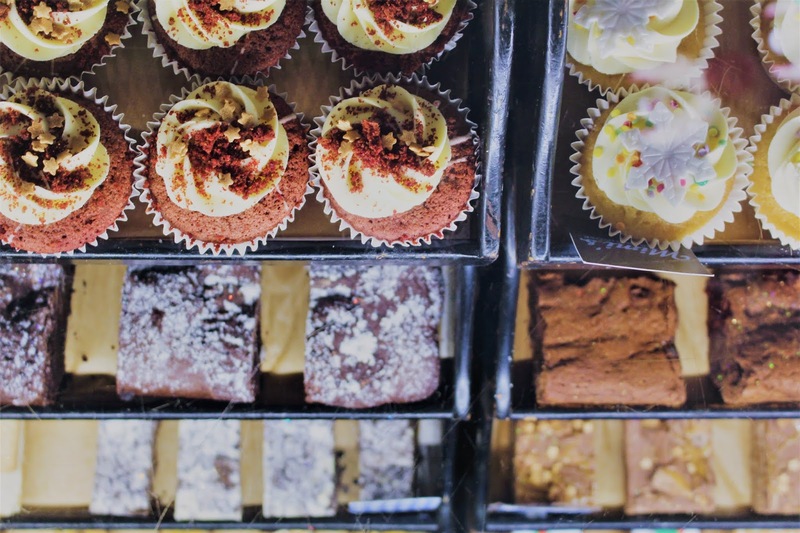 There is such a wonderful variety of baking to choose from and I would love to go back for another cupcake soon! The staff at Mimi's are so friendly, easy to chat to, and were so patient when we were trying to choose which cakes we wanted to try. 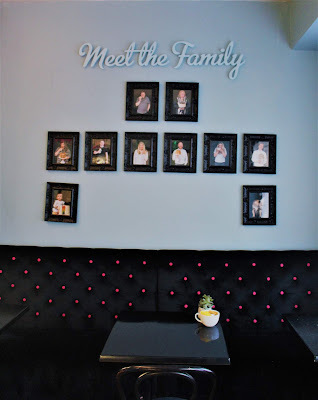 Overall, our visit to Mimi's Bakehouse was wonderful. The atmosphere in the little coffee shop is snug and homey, the staff are extremely welcoming, and the food is delightful. Mimi's Bakehouse in the Old Town is well worth a visit! You can find out more about Mimi's Bakehouse by visiting their website here. Last year was the second year in which I decided to have a word to focus on rather than setting resolutions. My chosen word for twenty eighteen was 'courage'. It was a year that shaped me and refined me; it pushed me beyond my comfort zone again and again. 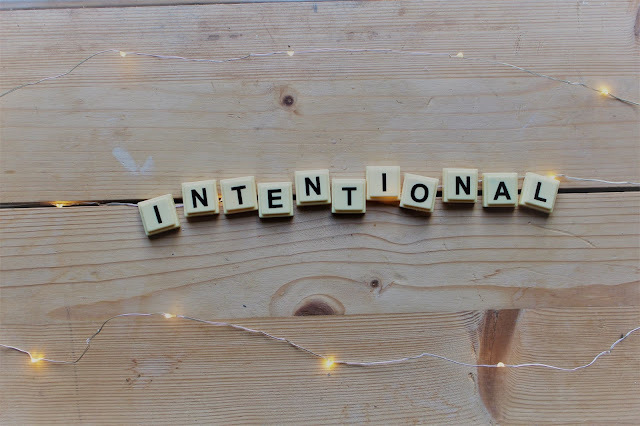 My word for twenty nineteen is one that has been clear to me for a number of months; 'intentional'. I was daunted when this word was first placed on my heart, I have found that the words God calls me to pursue are the words which I often feel unqualified for. Yet, over the past two years He has taught me so much about trust and courage, and now, alongside building on trust and courage, I am hoping to grow in intentionality. Over the past two years, rather ironically, I have not been as intentional as I would liked to have been in regards to my words for each year. I slowly allowed them to become an afterthought the further into each year we reached, rather than something for me to focus on and a characteristic to grow in over time. This year I am hoping to take the time to learn what it means to live each day with intention. 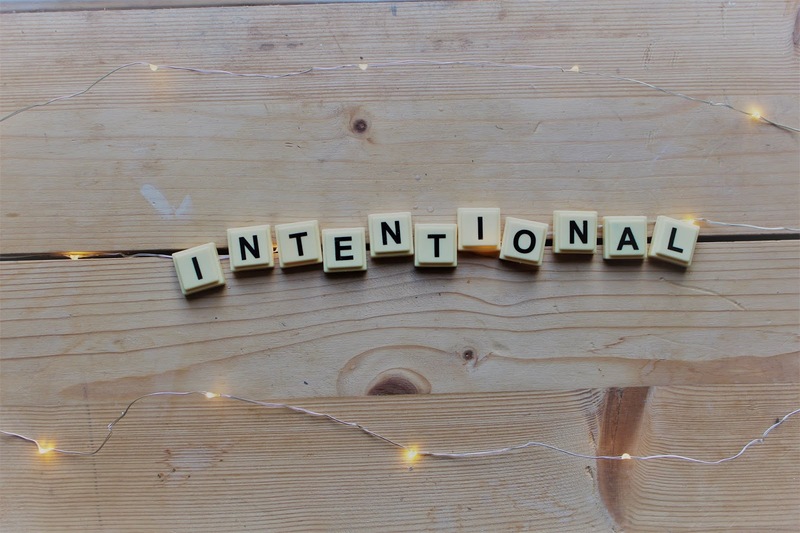 In particular, to be intentional in rest, intentional in relationships, and intentional in my faith, alongside growing in intention in other areas. Of course, as He has done in the past, I'm sure that God will teach me lessons in intentionality in the most unexpected yet beautiful ways. Looking back on twenty eighteen, it was a year of highs and lows, a year that was bookended at beginning and end with doubt and questioning. Yet standing at the end, I looked back on lessons of trust and courage, and within the doubt there is a steadfast hope that cannot be shaken. I am walking into twenty nineteen holding onto this steadfast hope and looking to God to grow me in intentionality with Him. Although we're heading into springtime here in Australia, I've been inspired by the transition into autumn back in the UK when looking at recipes recently. One of my favourite recipes that my mum makes this time of year back home is her homemade apple and caramel crumble. I thought I would try adapting the recipe I have for apple crumble muffins to include caramel to remind me of this time of year back home. Autumn is definitely one of my most loved seasons so it was lovely doing some baking to remind me of this, and I thought I would share the recipe with you. 1. 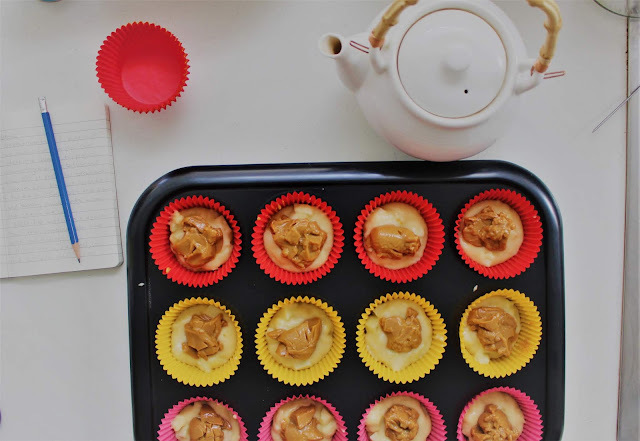 Pre-heat your oven to 180°C and line a 12-hole muffin tray with paper cases. 2. Make the crumble topping by rubbing together the butter and flour in a small bowl until it resembles breadcrumbs. 3. Stir in the oats and the sugar and then set this mixture aside. 3. For the muffins, take a separate mixing bowl and sift in the flour and the baking powder. 4. Stir the sugar into the flour and baking powder. 5. In a separate bowl melt the butter and then add the milk and the egg. Mix until combined. 6. Make a well in the center of the flour, baking powder and sugar. Pour in the egg, milk, and melted butter mixture. Fold gently until well combined and set aside. 7. Prepare the apples by peeling, removing the cores, and then cutting into small cubes. Then fold the apple into the muffin mixture. 8. Spoon a tablespoon of the muffin mixture into each case. Then gently place a teaspoon of caramel into the center of each paper case, followed by another tablespoon of the muffin mixture. 9. 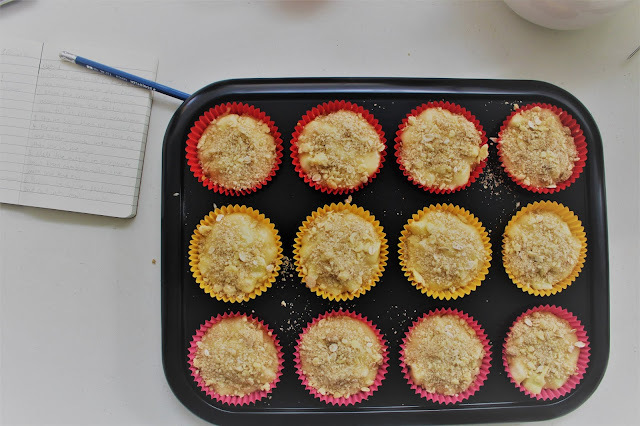 Sprinkle the crumble topping over the unbaked muffins. 11. Leave on a cooling rack and once cool use the leftover caramel to decorate or leave as they are. I piped the excess caramel on top of the muffins however, I think in future I would leave them as they are as I think this looks nicer. It's been a long time since I was last able to do some baking, so it was lovely being able to spend some time trying this recipe and turning one of my favourite desserts into an autumnal muffin. 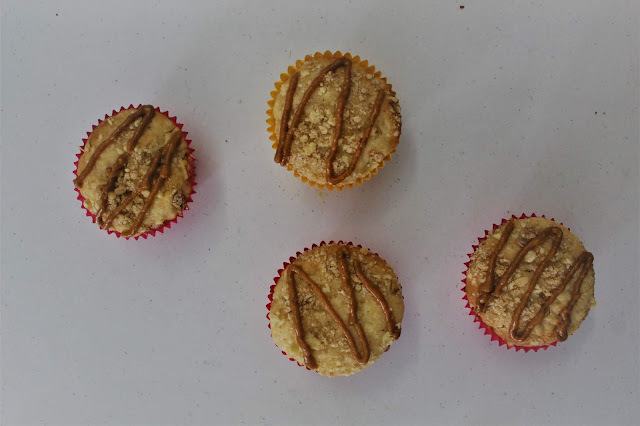 You can have a look through my other baking recipes by clicking here. Ever since I was little, I have loved to write. It's the method I prefer for processing my thoughts and expressing my heart. It allows me to think through the words I want to use and to choose my words with care. In the past, when I have been so aware of my anxiety, I have turned to writing as my way of both praying through my anxiety and processing my anxiety. I am acutely aware of my anxiety slowly wrapping it's way around my heart and can feel myself retreating inwards as a result. In these times a part of me is also aware that I need to make God my focus even when I'm painfully mindful of my brokenness. It has been a little while since I've experienced my anxiety in this way and I'm slowly learning to navigate this with God one step at a time. A lesson I am trying to learn this year is that of taking life one day at a time. This has been rather difficult for me and has required patience, humility, and strength; often strength that I do not have. I'm thankful that God is teaching me that the kind of strength I need can only be found through Him. Looking back, the past eight months have brought me closer to God in unexpected ways; I have faced heartache and refinement in ways that have brought me to my knees in complete surrender. Looking ahead this is how I want to continue into the seasons to come; on my knees in full surrender. I am learning that this cannot be done on my own and that I must look up to Him in order to keep moving forward with Him, especially in the face of my anxiety, and to continue using writing as my way of praying and processing. Throughout this year my blog hasn't been a priority for me and I'm beginning to be okay with this. It will probably continue this way until next year when I've moved back to the UK and I settle back in to life at home. This doesn't mean that I won't be writing in this time or that I won't occasionally share on here. But rather that I'll be learning what it means for me to write and to share, whilst also being present where I am, preparing for the seasons ahead, and taking life a day at a time. 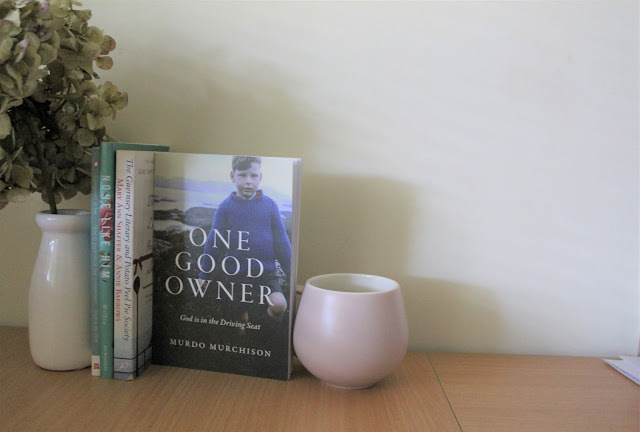 The thought of blogging again is a little daunting for me as I am still unaware as to what this will look like, but again, I'm beginning to be okay with this. I'm hoping that I can let go of the perfectionist mindset and anxiety I have in regards to my writing, and slowly but surely become comfortable with sharing on here again, whatever that may look like. I am hoping that I can learn the beauty in being vulnerable in my writing whilst also setting healthy boundaries in regards to what I share here. I am hoping that next year will provide me with more time to share my writing and my life on my blog, in the meantime I will be trying to update my instagram fairly often until I feel ready to be sharing regularly on both platforms again. May has been a continuation of April in many ways; a blend of dark and bright colours that have been brought together over the past four weeks. There are days that I look back on with regret due to the selfishness that I displayed. 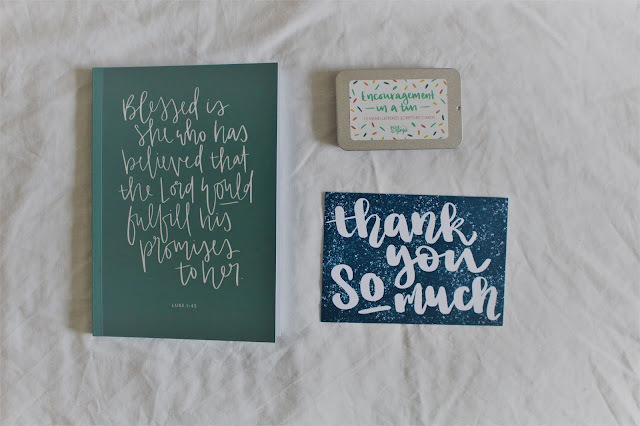 But I am mostly looking back on May with a very thankful heart; thankful for God's much needed refinement, thankful for gracious and loving friends, and thankful for all that I am learning within this season. I am thankful for May and the multi-coloured moments that have pieced it together and shaped my heart in so many ways. 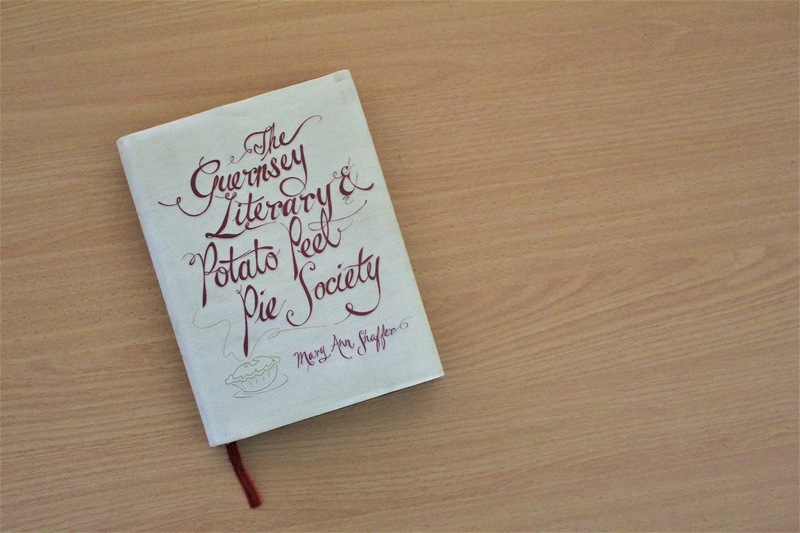 This book has brought me much comfort and joy whilst I have been reading it. It is written with such a gentle manner yet it has challenged my heart and my faith. You can order a copy of the book by clicking here. It was so lovely to be away from the city for a few weekends this month to visit different friends. On one of the weekends we visited the Blue Mountains and the Southern Highlands which was truly wonderful. Exploring little towns, visiting a farmers market, and going for a bush walk, made all the better by the fact I was spending this time with some of my closest friends. Something I never thought I would be thankful for yet I have loved playing volleyball with my classmates during our lunch breaks. I will admit that I'm quite terrible at volleyball but I've had a lot of fun getting to spend this time with classmates each week. Over the month of May I have had some friends visiting me in Australia. To have my closest friends come all the way from Scotland to visit has made me so happy. Spending time with them and exploring Sydney together has been wonderful. I am so thankful for each of them and the way that they all point me back to God. It has been such a joy spending time with them over the past month. This month I am growing in both my understanding of and my appreciation for God's grace. The ways that God has lovingly been helping me and teaching me to reach out for and accept His grace have been needed. It hasn't been an easy lesson for me to learn and I know that I still have a lifetime of learning in regards to this aspect of my faith, but I am thankful to be starting out on this learning process. Looking back on May has opened my eyes to the ways that God has been intricately at intimately at work in my heart and my life. I am thankful for each moment that He has used to hold together the month of May, and I am thankful for His grace that has held me together throughout it all. April has been a mosaic of both bright and dark colours. I've found myself facing refinement and being unsure of how to walk through it with my heart in the right place. But God has been gracious and for that I am so thankful. 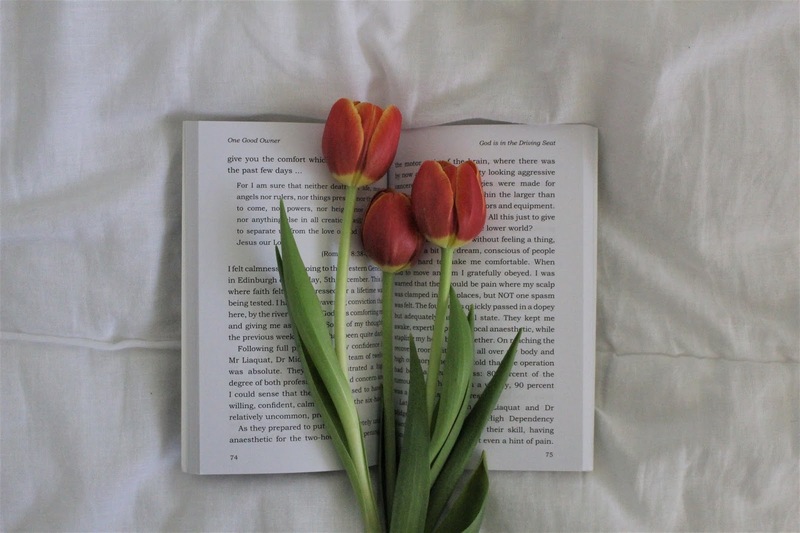 My thankful book had some days in April that were left blank, unsure of wether reflecting on the past twenty four hours would have helped or hindered my heart. Yet I look back on this month with God by my side and that is what matters most, I got through by His grace and His strength. And despite my selfishness He has displayed His love to me in beautiful yet simple ways that have soothed my heart. This month started off with a morning at the beach with my friend Maire. It was a lovely to start April and I couldn't have asked for a brighter soul to have spent this time with. I had the privilege this month of volunteering at KYCK youth conference in Katoomba. It was a full but brilliant weekend. The speakers for the weekend were wonderful and the message that was shared had such a great impact. At the end of this month I had the chance to stay with some friends in Wollongong for a few days. It was an example of how God knew what I needed when I was feeling a little fragile. It was really lovely to be out of the city for a while and to spend time with some friends who shared Gods love with me in such kind ways. When this book was gifted to me at the end of last year I had no idea how the story would touch my heart. This book and the story within provided comfort for me this month. Then seeing the film last night really uplifted my heart. Journaling used to be an automatic part of my daily routine, it was a way for me to process and to write out my prayers. But since the middle of last year I've felt myself struggling with journaling and losing the joy that I once had in writing. But this month I was encouraged to try again with journaling and although it is going slowly, I am thankful to be writing again. I will admit that I look back on some moments of this month with regret due to my selfishness and fear. But I am ultimately thankful for Gods grace and that each time I fall down, He offers His hand to help me get back up and to keep going. Visit Carolyn's profile on Pinterest. © Faithfully Carolyn. All rights reserved.